For anyone who’s a self taught polymer clay artist, you’ve already made some critical mistakes in claying. You tried a shortcut (that didn’t work) or tried a way to do something that ended up ruining your piece. It’s okay, don’t worry, we’ve all been there. This month we are going “back to basics” in creating with polymer clay. 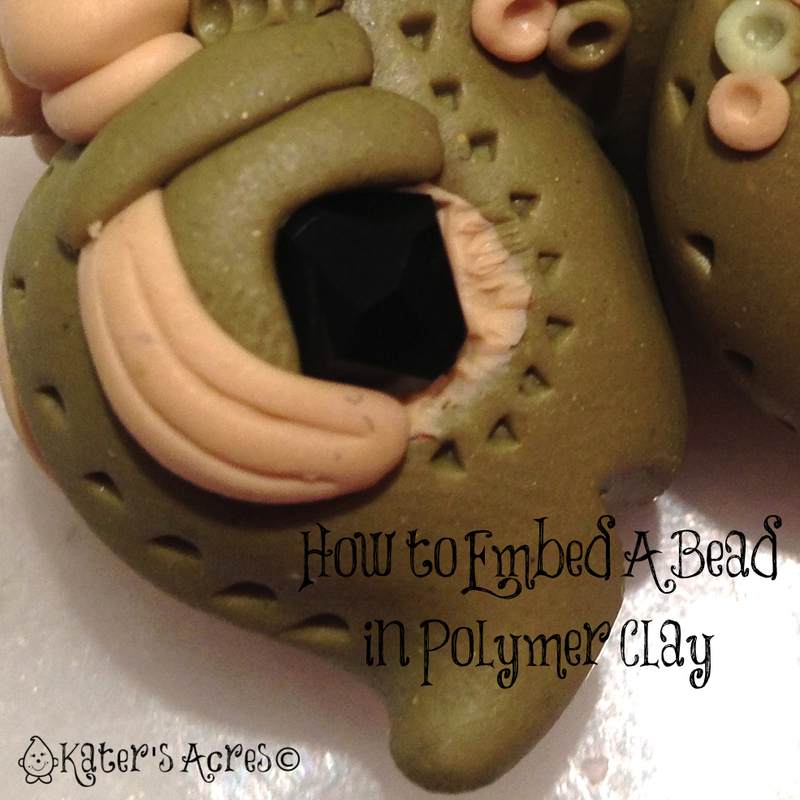 So for today’s mini tutorial we’re going to go over the proper way to embed a bead into polymer clay. At left, you will see step by step pictures on how to properly embed beads into polymer clay. As many new clayers find out, simply “pressing” a bead into clay will not make it hold. You have to either use liquid polymer clay to adhere it to the clay, or you have to embed it with wire. First choose a 24-28 gauge copper wire. (I usually use black 28 gauge copper or 24 gauge silver anti-tarnish wire). String bead onto about 1.5″ of wire. (Length of wire depends on size of bead). Using round nose pliers hold the ends of the wire steady and begin to twist the bead. One you have a twist approximately 1/4-1/2″ inch long, cut the ends of the wire with flush cutters. Then embed the bead into the area of polymer clay where you wish the bead to be placed. Make sure you embed the bead PAST the wires. Cover the bead with clay pieces/elements to ensure it will never move or fall out (see photo above). You are most welcome Denice! Enjoy and have fun claying. All great advice. In addition to the above Christi Friesen recommends bending the end of the wire into a little hook to anchor it in the clay. I’ve used this technique in all my clay work and never had a bead come loose. I’ve lost a few magnets but that’s a different topic all together. Thanks for the wonderful tips. Katers Acres Polymer Clay Frog Tutorial inspired by Christi Friesen - Photos too! Thanks for the tutorial. I know it is going to come in handy with my dragon…can’t wait for Friday!!! Thanks, Katie. I learned the hard way that these beads need to be secured with wire as well as eyelids and so on. Thanks for sharing.